I’m taking part in the MEGA Blogging marathon for the first time. It’s proving to be quite a challenge getting 26 protein rich recipes together especially when I’m a vegetarian/eggetarian. However, its through this challenge that I’ve learnt, there are so many sources of protein that lacto ovo vegetarians can include in their diets. My dad was visiting us in Montreal in Aug. He loves all his fried snacks and enjoys them for his brunch. Now all those who live in small apartments in the western world know that deep frying can be a bother especially when you don’t have multiple windows or doors to open up as in India or Kenya to let fresh air come into your home. As much as I would have loved to serve him with bhajias that are deep fried, I opted for a healthier and more ‘air friendly’ paddus. I hate it when the smell of hot oil lingers on in the air.He didn’t complain so I guess, the paniyaram pan and I passed the test. So here’s a recipe for mixed dal paddus which we snacked on without any guilt. I seriously don’t miss the fried version (okay I know they turn out much crunchier) but the taste wins and the paddus did turn out crunchy as I added a little bit more oil for my dad. Protein sources in this recipe are peas, moong dal, lentils, split chickpeas, spinach. Soak all the dals in warm water for 6 hours. Drain out the water, wash the dals. Do not drain out the skin of the moong dal. Process the dals into a coarse paste in a food processor. Add little water if necessary. Remove the dal paste into a bowl. Add the remaining ingredients i.e. onion, spinach, ginger, chilli, garlic, soda bicarbonate, cumin seeds, salt and remaining water. Heat a paniyaram pan over low to medium heat. Drop a few drops of oil into each cavity. Drop a tablespoon full of the batter into each cavity. Make sure to level it out a bit with the spoon. Cover the pan with a lid and let the paddu cook. Take the lid off and if the top part does not appear wet, flip the paddus. Add a drop or two of oil. Cover the pan and let the paddus cook. Cook till they are golden brown in colour. Serve hot paddus with tomato onion and garlic chutney or a chutney of your choice. Add onion and curry leaves and stir fry till the onions become soft. Add garlic. Stir fry for a few seconds. Add tomatoes, salt and asafoetida. Mix well. Cover the pan with a lid and cook the mixture till the tomatoes become soft. If it sticks to the bottom of the pan, then add a tablespoon or so of water. Add chilli powder and mix well. Add one – two dried chillis with the tomatoes if you don’t want to use the powder. Use any lentils of your choice. It is awesome that you have started the mega marathon. Trust me, it is so addictive that you simply cannot pass up the next time. The paddus look crunchy and delicious. A perfect snack for a chilly evening. Nice your dad enjoyed them. Lovely clicks! These paddus have turned out awesome Mayuri. Welcome to the mega BM and what a wonderful dish to start it with! That is a lot of protein rich ingredients in one dish. Love the way you made them in Appe pan. This would make a nice ad healthy starter for any get together or everyday eating. Good start dear. 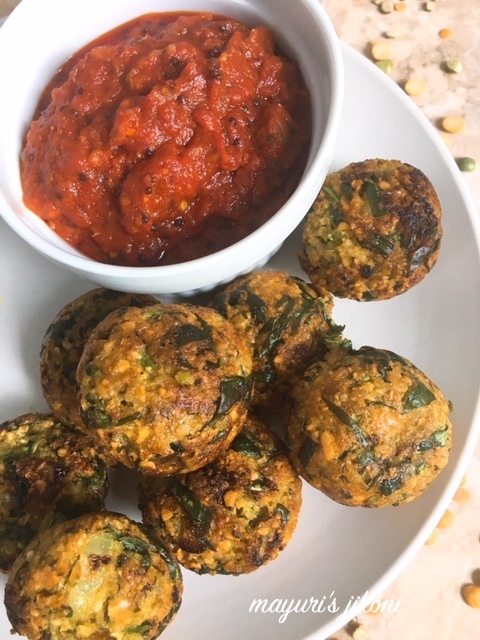 Lentils are a great source of protein and these along with peas and spinach make great paniyarams. The fried version would naturally be tastier but I guess the preference is for non fried . And yes ! All the best , it's your first Mega marathon. Super crunchy and yummy Dal paddu.. Feel like having some with chai right now.. you have tempted me enough..
Paniyaaram pan is such a boon and I completely hear you about frying in apartments. I stopped using canola and vegetable oil for the very same reason. The paddu looks very inviting and nice clicks. Excellent protein rich paddus, feel like grabbing and having that whole plate rite now.My mouth is just watering here. What a lovely dish to kick start this mega marathon Mayuri. oh I know what you are talking about! Our house is saturated with the smell of Indian food sometimes. There isn't much you can do about it though. Paniyaram pan is a good idea to reduce the damage both smellwise and health wise. Delicious paddy n healthy too. I am glad your dad liked them. Must try on mine. The paddus and chutney look delicious. I will be saving your protein rich recipes as they look so healthy. Lovely recipe and combination of mixed lentils with peas and spinach makes more healthy. Love to have with green spicy chutney. Welcome to mega marathon and looking forward to your recipes.The dhal paddu s looking so healthy and we do make something similar with dhals. Love your clicks… These cute balls are tempting me so much…. The snack looks so tasty and inviting.. I feel like grabbing one right now. Hey I have also planned a similar recipe for this mega marathon. Tough I havent prepared it yet since I have planned it for the last week. Yours seem fabulous. Superb clicks. Looking forward to your other recipes. Ah I have read this post and left a comment, not sure how it is missing. Paddu with combination sounds excellent. Wonderful start!